On Thursday, April 17 and Friday, April 18, Duke University will host a visit from Francesca Samsel, a visual artist who uses technology to develop work on the fulcrum between art and science. Francesca works as Research Assistant Faculty in the Computer Science department of the University of Texas at El Paso, is a Research Affiliate with the Center for Agile Technologies at the University of Texas at Austin, and is also a long-term collaborating partner with Jim Ahrens’ Visualization Research Team at Los Alamos National Labs. Francesca will give two presentations during her visit. A presentation on Thursday afternoon for the Media Arts + Sciences Rendezvous series will address the humanities community and present recommendations for work with scientists and visualization teams. A presentation over lunchtime on Friday for the Visualization Friday Forum will describe a variety of collaborations with scientific teams and address the benefits that can come from incorporating artists into a scientific research team. Francesca’s visit is sponsored by Information Science + Information Studies (ISIS), with additional support from Media Arts + Sciences. We hope you can join us for one or both of the presentations! Many artists draw on the scientific community as sources for their work. Research community are exploding with rich material connected to our contemporary lives. Given that art – science collaborations require weeks, realistically months, in a lab, shoulder to shoulder with the scientists, access is a huge barrier. Francesca Samsel will discuss her history of collaborations with visualization teams and scientists, what worked, what didn’t and how to get in the door. Francesca Samsel will discuss her ongoing work with Los Alamos National Labs, Research Visualization Team and why they hired an artist to help them design the next generation of scientific visualization tools. Their recent work focuses on developing algorithmically generated color maps to extract the maximum perceivable detail within exa-scale data sets. 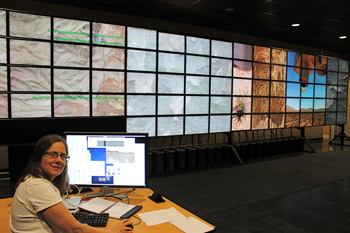 She will also discuss collaborations with the Visualization Division of the Texas Advanced Computing Center; hydrogeologists, neurologists, environmental research teams and more.